It seems like poor old Yu Narukami and the rest of the investigation team can’t break away from having to dive into the Midnight Channel and rescue someone. This time around, the gang is gearing up to perform alongside friend Rise as she attempts to revive her career as an idol. Of course, before they can get too far into their training, a video starts to surface and then in typical Persona fashion, the group is forced to dive in and save the girl group Kanamin Kitchen. Yu and his friends won’t be able to summon their Persona’s this time around and will be forced to dance their way to safety. The story in Persona 4: Dancing All Night is solid enough to keep your going and fairly lengthy, should you decide to not skip any dialogue. My main gripe is that unlike the RPG and fighting game that preceded this, the story in Dancing All Night just didn’t wow me. Sure, it was cute, funny, the characters were good, and it was interesting enough. However, it just didn’t have that normal wow factor that had me desperately pushing to get to more story. Yes, I know you can’t compare an RPG’s story to one for a rhythm game, but I just expected a little more I guess. In the end though, the game does a great job of pushing the story at a steady pace and staying true to the P4 universe. It’s not flashy but it gets the job done. Enough about that whole story thing, let’s get onto the dancing, button pressing, gameplay. 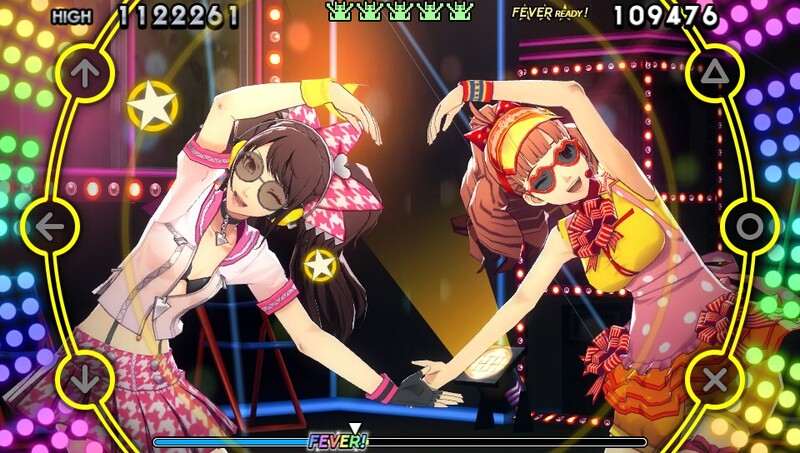 P4: Dancing All Night is really easy to pick up but can get extremely difficult to master on hard difficulty, where notes are flying past at breakneck speeds. Players are presented with three buttons on each side of the screen, having to hit one of three d-pad buttons or face buttons whenever the on screen prompts line up with said button. There are single presses for notes, as well as long drawn out holds, and times where you will need to simultaneously press a button on each side of the screen. At times during the action, you will also see a blue or multicolored ring, in which you will have to quickly hit the joystick at the right time to nail. The button combination makes so much sense and like the game is easy to pick up but so hard to master when things get really hectic. There are two modes in the game, Story and Free. The story mode, as you would expect, follows the cast as they dance their way to solving the mystery. The story mode feels very similar to the setup it had in Persona 4 Arena Ultimax. The free mode allows players to pick a song, difficulty, and then try to get their best score. As you beat the songs in Free mode, you unlock new tracks as well as unlock the ability to use different characters in the songs. Each track will allow you to have a main character and a sub character, that pops up on screen whenever you go into fever mode. This mode kicks in after you score so many points and allows you to rack up extra points. There is also a secret mode called All Night, which once unlocked, will really challenge players with diagonal note pressing and is the hardest difficulty in the game. At the end of each song, you will be rewarded with a total score and money, which can then be used to purchase new outfits, accessories, and items. The outfits and accessories range from things like glasses and funny mustaches, to summer and winter outfits for the group. Items though, can be turned on before a song and give you certain perks, like the ability to hit a single button in a song to hit any of the notes. These items come at a cost though, as turning them on reduces the amount of points and money you can earn. There is enough to earn here that makes collecting them all kind of fun, but the costumes and accessories are fairly limited per character, especially Teddie. What would a rhythm game be without a killer soundtrack? Well, probably crap to be honest, but you won’t have to worry about that sort of thing here. Persona 4: Dancing All Night will have you bobbing your head and button mashing through every single track and remix that you can handle. Aside from maybe one or two tracks that I just couldn’t get into, the game features a track list that just keeps on giving. Whether it’s the Junes theme or the P4 opening theme, there is something for everyone to enjoy. My only minor gripe is while I know this game focuses on Persona 4, I would have loved to see a few classic P3 songs included, such as Burn My Dread. Review code for Persona 4: Dancing All Night provided by publisher. Reviewed on PlayStation Vita. For more information on scoring, please read our Review Policy here. The soundtrack is body shakin' good!